I visited in September and was fortunate to have enjoyed wonderful sunny weather throughout my stay. Zurich is a very easy city to get around. It is however, rather expensive, so skip it if you are on a budget. 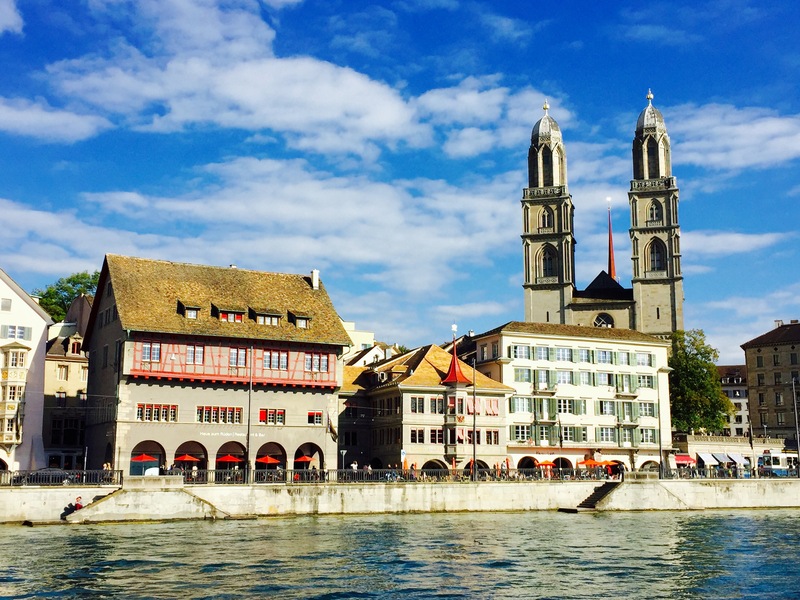 Take a stroll through Bellevue Platz Town and Old Town, which is full of historical charm with sites such as the Romanesque style church, Grossmunster, then relax in the park along the River Limmat. Explore the former industrial neighbourhood turned hipster haven of Harbrucke where you can check out furniture and fashion boutiques under Hardbrucke bridge or enjoy a cold drink and a snack at Frau Gerold’s Garten – a funky outdoor restaurant and bar area with cool designer stores near by. Cuisine: The traditional foods of Zurich are very rich with lots of wursts, pretzels, cheeses and veal. Try currywurst, Zurcher Geschnetzeltes – sliced veal strips with white wine and cream, roesti, raclette and fondue. Be warned though, if you eat a typical Swiss meal everyday, you’ll feel your pants getting tighter! This entry was posted in destination, Europe, Go, Switzerland, Zurich. Bookmark the permalink.